Obviously we've all heard by now that it's not good for us to drink water from plastic water bottles. 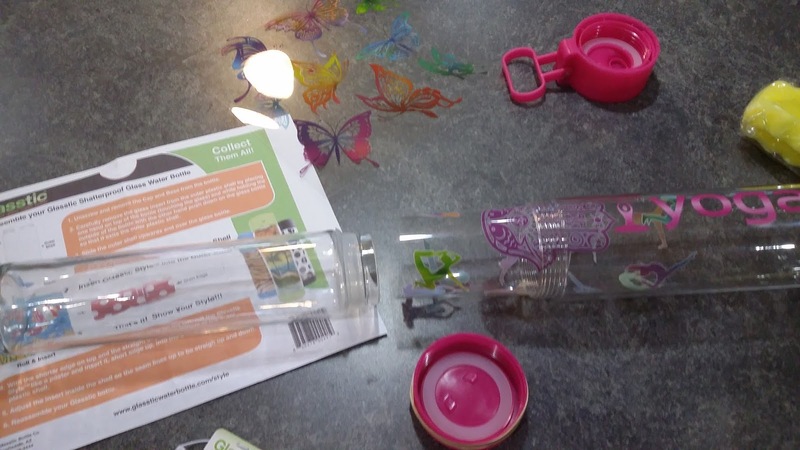 There are some plastic bottles that say BPA-free, but they contain other plastics. Although those plastics are supposed to be "better" for you, how can we really tell? They might find out next year that those plastics aren't good for us either! Plastic bottles are so much more convenient than carrying around something glass, though. Until now. 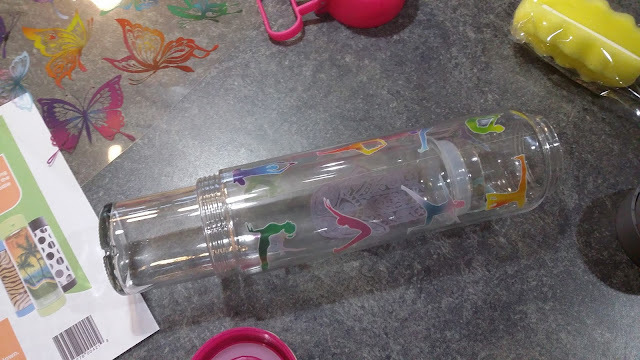 Now, there is a bottle that is glass on the inside and plastic on the outside. These super-fashion-forward bottles are made by Glasstic. I received a bottle for free to facilitate my review. All opinions are my own and no other compensation was received. 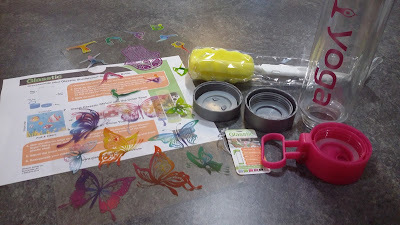 Plus, you can decorate your bottle in a lot of different themes. The bottles have clear inserts with designs on them that slide between the layer of plastic and glass. The bottle I received came with 2 inserts and 2 colors of bases and lids. One of the lids is a flip-cap. Mine also came with a bottle brush. 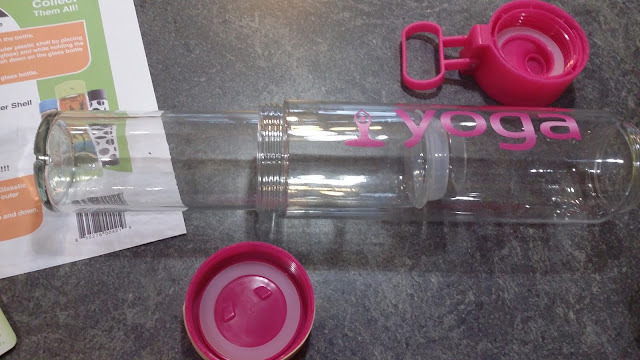 I chose the "Yoga" theme in the bright pink color. In case you were wondering, I look crooked because that hand is still healing and I still don't have full range of motion in that wrist! This bottle has inspired me to try to do yoga or pilates every day in December except Christmas Eve and Christmas Day. . . . . I have to be ready to put my skivvies on in front of people and run in that Undie Run in February! Must. Get. In. Shape. Plus, I just feel better and stronger when I work out consistently. 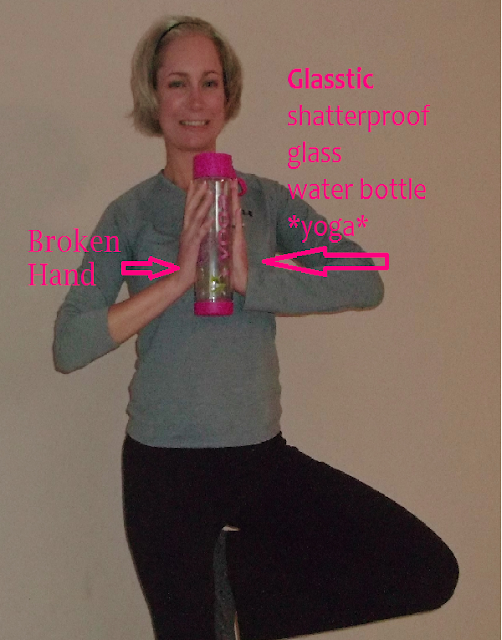 I'm going to grab my yoga mat and my pretty shatterproof Glasstic bottle and get it done! The bottles are shatterproof. They have been tested by an independent company to be shatterproof when dropped up to 6 times on it's bottom. If for any reason under normal use, any part of your Glasstic Bottle breaks, it can be replaced. They have several packages to choose from. There is a basic Glasstic value pack for $20 which includes the bottle, 2 Styles (the plastic design sheet insert), gray top and base and the color flip top and base that you choose. And now, the bottle brush comes with any order of one or more bottles. Or, if you'd like to order bottles for your whole family, they have 3-pack, 4-pack or 6-pack packages. If you'd ever like to change your Style, you can order Styles separately as well. It's easy-peasy to change the Styles. Insert the Glasstic Style and straighten. I had a hard time choosing which Style I wanted to use because they were both so cute! I ended up with yoga poses. But who knows. . . I might switch it to the butterflies tomorrow! Afterall, butterflies signify change and growth. Reinsert the glass insert and screw the flip-top and base back on. Get ready to go where no glass bottle has been before! No glass bottles allowed around the pool? No problem!!! Just in case. . . . the lid also has a lock on it so that it won't accidentally flip open while you're active. I thought that was an ingenious touch as well. The folks from Glasstic are allowing us to host a Giveaway!! 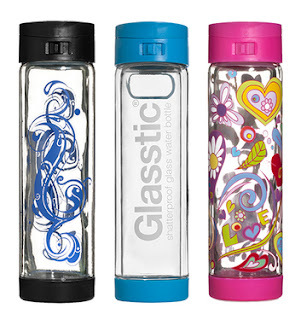 2 Winners will get their choice of 1 Glasstic Bottle. Giveaway is open to US Residents who are 18+. Giveaway ends 12/22 at 11:00 PM EST. You may enter via the Giveaway Tools form below. Now, if you'll excuse me. . . . I have to go get my yoga on for my December Yoga/Pilates challenge. I would use this bottle while at work on my desk. I would use it for iced tea throughout the day. That looks like a great water bottle. I hope your hand heals fast. I'd use it in the car. I would save money not buying drinks at drive throughs. This would actually be for my husband. He wants a glass bottle to drink his water while he works out. I could use it when I go out walking. That would be nice. I would use it when I'm walking with my son! I would use the glasstic bottle for work or bring it to the gym. I'd use it every day for whatever I'm drinking, whether its coffee, tea or water! I would fill it with water and take it to work. I would use it on my walks. I would use it just lounging around all day!